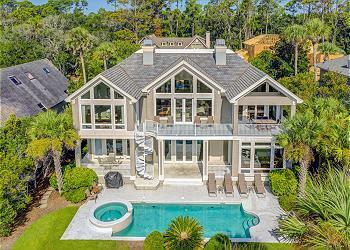 Ocean views are everywhere you look from this seaside home in Palmetto Dunes. The lower level, with a convenient wet bar, leads out to a shaded patio and a sprawling, sun-drenched lawn and pool area with *heated pool and spa, all with breathtaking ocean views! A stunning staircase leads to an open second floor that’s awash in island colors and includes living room, dining room, and large chef's kitchen. Beach and ocean views can be seen from the entire space. Also on this level, there’s a king master suite with doors leading out to a covered deck that’s perfect for enjoying a morning coffee, soaking in the sea, and letting the real world float away with the tide. •	*Private heated pool and spa (16 x 30 kidney) *This pool & spa have an electric heat pump. The pool & spa can be heated for an additional fee of $300 + tax per week. If you would like to heat the spa only, the cost per week is $225 + tax.